There is much merit to arguing the problems with the American Health Care Act with regards to its failure to value human life and access to health care. As a health care bill, it fails miserably. As tax policy, it is equally disastrous. Make no mistake: While wreaking havoc on the health care system and undermining the health and well-being of our neighbors, Congress plans to cut taxes for the wealthy and raise the costs for everyone else. The repeal of two Medicare taxes paid by high income earners will primarily benefit millionaires. These taxes also achieved greater equity in the treatment of unearned income under the tax code. Repealing those two taxes would mean that a couple making $10 million would see their effective tax rate cut in half. 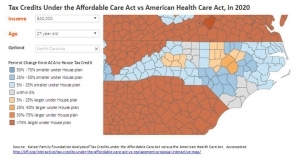 The changed structure of the tax credits will mean North Carolinians, on average, will see a more than $5,000 loss in help to pay their health care premiums. In fact, the drop for the average consumer in North Carolina ranks us second in the nation. This will likely mean that North Carolina will be hardest hit by increasingly unaffordable health care and also the likelihood of a rise in the number of uninsured costing everyone. 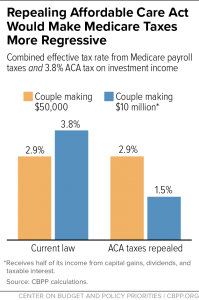 More detailed analysis of the tax credit provision shows that the House’s tax credit structure will primarily benefit North Carolina consumers in more urban counties and those who are younger. The Kaiser Family Foundation has a series of interactive maps analyzing the impact on North Carolinians in different income and age groups. Many reports have pointed to the nationwide findings: Older, low-income and rural people will lose the most. This is because of the tax credits as well as various other provisions of the House’s plan that allow older people to be charged more, eliminate help for out-of-pocket medical expenses and remove the individual mandate. 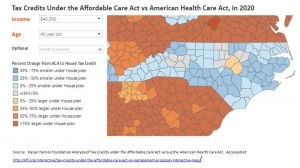 Here are three telling maps from Kaiser’s underlying analysis that show the harm of this proposal to consumers across the state, but particularly low-income, rural and older North Carolinians. 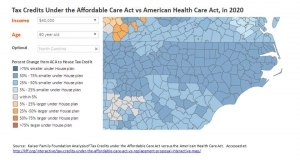 The maps track the impact of the change in the tax credits from the Affordable Care Act to the House’s Plan, keeping income constant at $40,000. This income is the bottom 40 percent of North Carolinians but notably twice the income of the average marketplace consumer. The results for those with $20,000 in income were losses of 25 percent or more across the state for all age groups. Those North Carolinians 60 years old with an income of $20,000 would see even greater declines: In Watauga, the loss would be $12,000, while in Harnett County, the loss would be $13,000. On the flip side, households with income above $100,000, or the top 20 percent of households in the state, will see at least a 75 percent increase in the value of their tax credit under the House plan, except for 27 year olds in that income group, who see their tax credits stay roughly similar. To add insult to injury, the flawed replacement plan expands the contributions allowable to Health Savings Accounts, a tool that primarily benefits the wealthy. The House’s plan also reduces the penalties for using funds for non-medical expenses. Health Savings Accounts are a policy that the GAO has found to be used as a tax shelter by the wealthy. Making sure health care is affordable is an important public policy goal that advances the well-being of all people and improves the functioning of our economy. Subsidizing the health care of the wealthy through tax breaks should be not be a public policy goal, nor will it help us achieve our long-term vision of a healthier, more productive country.